May 25, 2017, © Leeham Co.: Boeing says its very future, and that of US aerospace industry, is at risk if Bombardier’s deal with Delta Air Lines for 75 CS100s and 50 options is not fined for price dumping. That’s the claim company officials made in testimony before the US International Trade Commission May 18. Boeing filed a complaint with the ITC and the US Department of Commerce April 27, charging that Bombardier sold the CSeries to Delta for $19.6m, a price so far below production costs that it constitutes “dumping” under legal definitions. Bombardier and Delta deny the price and Bombardier denies the over-arching dumping claims. LNC reviewed the 290-page transcript of the May 18 hearing. Boeing claimed the CSeries will kill the 737-700 and, more importantly, its successor, the MAX 7, through the low prices offered United Airlines and to Delta in competitions last year. Delta has just 10 737-700s in its fleet for use at challenging airports. Source: Delta Air Lines. United that this set a new floor that affects the pricing of the MAX 7. From here, prices will have to drop on the rest of the MAX family, Boeing claims, resulting in a cascading effect that threatens the very existence of Boeing and, ultimately, the US aerospace industry. United later switched the -700 order to 737-800s and MAX 8s. Boeing pointed to the United deal it actually won as the start of Bombardier’s alleged dumping in the US market. Officials said they had to offer United the 737-700 at a very low price to win this deal, undercutting Bombardier. At the time, LNC was told by several sources Boeing sold the -700 for about $24m, a price a United official denied. Boeing later also denied this figure, but the true cost is not known by LNC. United ordered 40 and later upped the order to 65. Still later, after a new president and CFO joined UAL, the order was swapped to the 737-800 and the 737-8 MAX. In the hearing, Bombardier officials said they responded to a requirement for a 100-seat airplane. The CS100, in two-class, seats 110. United said this was too big, so BBD offered what it called a CS100 Lite, officials testified. A reporter covering the testimony write this meant BBD was willing to shorten the CS100, which is already a shrink of the CS300. This was incorrect; BBD was prepared to price the airplane as a two-class 100-seater, with a plan for United to pay extra should the additional 10 seats be needed. Parenthetically, the Delta testimony revealed that its transaction with BBD priced the CS100 as a 1,000-mile airplane. Should Delta begin using the aircraft on longer routes, additional monies will be paid to Bombardier. The CS100 has a range of more than 2,900nm. Bombardier testified that its competition at United was the Embraer EJet. Thus, they were surprised when United changed course and ordered the larger 737-700 that hadn’t even been in the mix during the sales race. It’s believed by LNC but never has been confirmed that Boeing and United tied other considerations into the -700 deal, possibly involving the 787 or 777-300ER. In the Delta Air Lines deal, the airline began talking with Boeing about used E-190s and Boeing 717s. 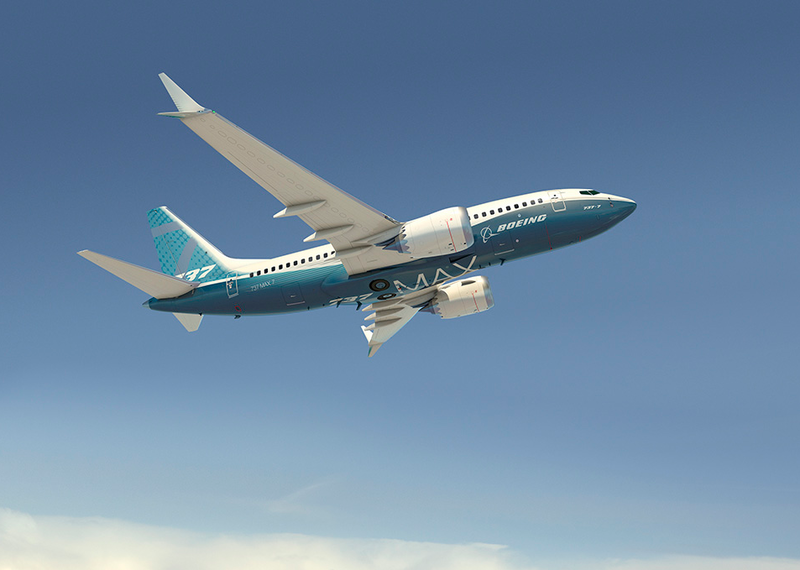 Boeing had 19 E-190s to dispose of, having committed to take them in on trade as part of an order with Air Canada for the 737 MAX. The MAX deal included options for the 737-7. Delta testified it purchased the 19 E-190s, but rejected the 717s because none was available during the period it required and there were enough in any event. Delta called the 737-7 MAX uneconomical vs CSeries, rooted in 1960s design and an inefficient shrink. Source: Boeing. After purchasing the E-190s, Delta discovered that trying to buy 56 more on the open market, to reach the figure of 75 aircraft needed, it would cost 40% more than the price paid to Boeing for the ex-Air Canada airplanes. Accordingly, Delta immediately moved to sell the 19 E-190s without putting any of them into service. Delta testified Boeing never offered any new-build aircraft because Boeing doesn’t have an offering in the 100-125 seat sector and it didn’t have any available delivery positions in the period required. Furthermore, Delta testified it doesn’t like the 737-700, calling it uneconomic. DAL has 10 in its fleet, for special airports that have short runways or which have hot and high performance requirements. Delta ordered these in 1997 and took delivery in 2007-8. Airline officials also rejected the MAX 7 as an option even if delivery slots had been available, calling the airplane rooted in 1960s design, an inefficient shrink of the MAX 8 and uneconomic vs the CSeries. They also rejected Boeing’s claim of rock-bottom pricing. Boeing claims the $2.5bn series of government bailouts, which rescued Bombardier from certain bankruptcy, are illegal and enable Bombardier to “dump” the CSeries in the US. Boeing says the funding, which came from the Quebec province and federal governments and a pension fund for the Quebec government, are illegal subsidies. Bombardier’s sale to Delta—with deliveries beginning next year—should be taxed at almost 79% by the ITC, Boeing says. A companion complaint before the US Department of Commerce, on the same issues and facts of the case, also calls for a 79% tariff. Bombardier and the Canadian government, testifying last week, rejected the claims. Bombardier said the pension fund invested equity in Bombardier’s rail business. Likewise, the Quebec money was structured as equity in a new Bombardier joint venture with the province. The federal investment was less than US$250m. The ITC is scheduled to render a decision my mid-June. Think about the all potential jobs lost, in the US. Maybe the perception is this US First government is willing to build on alternative truths. In the grand scheme of things, it’s interesting to note that Boeing admit a baby narrowbody fm a small firm across the border, namely the CSeries fm a manufacturer 6 times smaller, hv real potential to wreck their 100yrs old empire. Vastly different corp confidence level now vs half a century ago. Back then, Bill Allen instructed(politely of course) airlines worldwide to order 747 or risk being left behind by the mkt. Many did followed his instruction and @ least took deliveries initially….ironically including DL. Today, it’s order fm us or risk being fined by the Trump administration…. Firm backlog for Max alone is 10x larger than CSeries’. No way BBD can get anywhere near 25% of that volume even if they start offering buy 1 @ list price and get 3 for free to every CSeries buyer. Huge part of the Max backlog covers a size segment simply untouchable by the CSeries platform including the mythical CS5….a variant that can never fit 200seats like the Max200 can(Unless BBD want to play the tail-strike protection game forever). Don’t get me wrong. I think Boeing’s products are still excellent….including the Max(not as bad as DL make it out to be). But something is wrong @ Boeing mgmt when they cry foul for both losing a deal(i.e. DL re CS1) AND winning a deal(i.e. UA re 73G). I’m not buying Boeing’s argument, unless they are trying to say they’ve completely jacked it up across all their business lines that 75 sales of the excellent C-series is the proverbial straw that will break the camel’s back. Boeing happily sells aircraft which are subsidized by governments on both sides of the deal to Emirates, Qatar and Etihad. In fact, Bombardier’s sales team are neophytes compared to Boeing’s. This level of hypocrisy would take a team of DC lawyers to invent. Wish that Boeing spent money on developing a competitive offering or even investigated the purchase of BBD rather than buying back shares on the stocks. I think that Canada should review its plan to buy Super Hornet as an interim measure…. Boeing execs probably have stock options. Increasing the share price is in their interests. Buying BBD would likely have depressed the price in the interim, even if it was the right thing to do for the long term. The Bombardier-Beaudoin family owns a majority stake in the company in order to prevent sharks from grabbing BBD for a pittance and sale each division piece by piece. If not for that the company would have been sold a long time ago and the investors on both sides would have been laughing all the way to the bank. Instead they are all crying today. On top of this the provincial government, equivalent to a state government in the US, has 49% equity in the C Series programme, and BBD needs their agreement for any important decision concerning the airplane. Canada is doing exactly that and said so publicly. Actually the day this happened a Boeing representative was scheduled for a meeting in Ottawa to discuss the F-18 purchase and was sent back home. And the now 10s of billions Boeing gets in tax cuts is irrelevant of course. So what of the prices Boeing initially asked for the 787? List prices were below list prices for the 767 at the time and we all know how long it took Boeing to at least break even on production, while we all also know that Boeing is yet to turn a profit in the 787 programme, i.e. on average, all 787s sold so far have been sold at a loss (I know – that last bit is a silly way of looking at it, but Boeing started these shenanigans). And as for illegal subsidies – give me a break and look at the tax breaks Boeing is getting for the 787 and 777x production lines. My main takeaway from this: The CSeries is apparently quite clearly a much superior product to the 737-700/737-7 (and arguably the A319/A319neo as well) and as a last straw attempt Boeing are trying to make it go away (or something) by suing. For the record: I own neither Boeing nor BBD stock. This is just what I was thinking. The 787 is nearly $30bn in the hole from ‘deferred production cost’, which is nothing more than pricing below production cost. Boeing claims this is program accounting when they do it, but dumping when BBD does it. Forbes estimated that Boeing sold early 787s for $85m below production cost. Boeing got $5.7bn in tax breaks from the state of Washington which didn’t buy ownership and never has to be repaid, more than twice as much as the $2.5bn BBD got in exchange for giving up a third of its train company and half the C series. Maybe all these actions are illegal, but Boeing seems far more guilty than BBD. No no no, You guys just do not understand. As I was told one time when I first staring working by a guy who was leaning on a shovel, do as I tell you not as I do. Of course after mental shake or two I responded, maybe you should get that shoveling to doing what its intended and not as a leaning post? In addition those deferred production cost don’t even included the R&D cost which is about 10-20 billion for the 787. Its does include R&D costs. What isnt counted is the investments made by its main suppliers in Italy, Japan and Witchita. Actually, no. R&D costs are booked as they occur. So the 33 billion production deferred cost + unamortized tooling don’t include the initial R&D investment. For example, Boeing recently write-off about 1 billion from the deferred production cost as it figures out that 2 early 787 can’t be sold. The 2 787 are rewritten as R&D cost. “The company removed 847 million after-tax dollars from the deferred costs line and moved them to an R&D expense line. While $847 million is real money, it represents less than 3% of Boeing’s total deferred costs. 2016: $4,627 million, or 4.9% of total revenues. 2015: $3,331 million, or 3.5% of total revenues. 2014: $3,047 million, or 3.4% of total revenues. 2013: $3,071 million, or 3.5% of total revenues. 2012: $3,298 million, or 4.0% of total revenues. 2011: $3,918 million, or 5.7% of total revenues. 2010: $4,121 million, or 6.4% of total revenues. 2009: $6,506 million, or 9.5% of total revenues. 2008: $3,768 million, or 6.2% of total revenues. 2007: $3,850 million, or 5.8% of total revenues. 2006: $3,257 million, or 5.3% of total revenues. Truly murky stuff. Very interesting to see a flavour of the complications involved in frontline sales. Every added wrinkle in this saga means it becomes less and less transparent what the real state of affairs are. I stand by my previous comment on this. Boeing have no expectation of winning a ruling in the foreseeable future. This is for domestic consumption and to pressure BBD as they suffer a sales drought. What Boeing says is actually very good publicity for Bombardier. For in this saga Boeing appears to be terrified by Bombardier. In other words Goliath is afraid of David. Wait a minute, was it not supposed to be the other way around, with Boeing and Airbus pricing the 737 and A320 so low as to put Bombardier out of business? Is this testimony revealing to us that they can’t do this because they have nothing to offer that can compete with the C Series? In other words it is Boeing who is doing the dumping. Boeing should know this, and the whole thing makes them sound desperate. So what Boeing has achieved so far is to make Bombardier look like a real powerhouse, which it is definitely not, and the C Series like a formidable airplane, which indeed it is. Actually what is happening here is that Boeing is preparing the ground to make into a reality exactly what it is trying to prevent: another Airbus. True except in trade terms you can’t “dump” in your domestic market. But it was Boeing that set the low bar on pricing with the 737 deal to United – and that deal was done PRIOR to the investments made by the Quebec government and pension fund. Bombardier did what any rational competitor does in a market when they see another company selling product ultra-cheap – they realize that to have any chance at survival, they need to do the same. Interesting to see Boeing bring a lawsuit based on things it had initiated. The sad part is that they just might win given the current political climate in the US. True, but the pension fund you are talking about, Caisse de dépôt et placement du Québec, only took a participation in the Transportation division, which is headquartered in Berlin, Germany. As for the Québec government they did not invest in Bombardier directly but instead took equity in the C Series programme. All this is pretty smart I would say, because it is perfectly legal under international law and both investors will likely make a lot of money in the end with their respective investments. All Boeings screw ups were prior to BBD doing anything. Of course I am in charge of spider removal in the house, despite my wife being 3 inches taller than I am. What is next, we sue Licktenstein because they threaten the US? The Mouse that Roared indeed. Sue Cessna, they make small efficient aircraft, god knows in a few years they will threaten Boeing to. @bruce levitt. “True except in trade terms you can’t “dump” in your domestic market.” this is why dumping law is so flawed to beging with. If boeing start selling planes at $ 1 each don’t tell me it not dumping home market or not ! LNC: Delta testified it doesn’t like the 737-700, calling it uneconomic. Airline officials also rejected the MAX 7 as an option even if delivery slots had been available, calling the airplane rooted in 1960s design, an inefficient shrink of the MAX 8 and uneconomic vs the CSeries. Now that is plain harsh. Hurtful words, nanner nanner, you mother wears army boots. Gads, the horror. The execs must have cried all night. Yes, and to make matters worse they have since all been fired. In fact, only 4 units has been converted into 737-800, the 61 remaining has disappeared of the backlog. Maybe because UAL will be a 737-10 launch customer ??? Do we know when the verdict is expected? And now they torture us having to wait. I hope they have a Garland type to write the summation. I come from a different culture and I have no idea what a Garland type is. Could you please explain this for me. I believe that TransWorlds’s use of “Garland type” was in reference to Merrick Garland, Chief United States Circuit Judge of the United States Court of Appeals for the District of Columbia Circuit, who was nominated by former U.S. President Obama to fill a vacancy on the U.S. Supreme Court in the last year of President Obama’s last term in office (2016). Judge Garland’s nomination to the Supreme Court lapsed without having been acted upon by the U.S Senate when President Obama left office. I have tried very hard to not take any side on the controversy surrounding Garland’s nomination in what I wrote above. In most of my post’s I am not trying to take sides, but rather pointing out some piece of information that I ran across, that contradicts or contrasts in some way that I think is interesting or important with assumptions that are being made in some line of argument, ranting, or venting. A recurring example of this lately, is my trying to point out the differences between how U.S. and international trade bodies actually define and distinguish between dumping and disallowed subsidies, using quotes from the websites or regulations of various trade bodies and agencies, and what many of the people who post here seem to imagine that international trade law says, which is a project that seems to have had very little success judging by what I continue to read in posts. See the link below if you are interested in more information on Judge Garland. Yes, very well expressed person without the goo. The “verdict” that is due in mid-June is a preliminary determination by the USITC as to whether there is reasonable indication that a U.S. industry is being materially injured or threatened with material injury by the imports under investigation. This determination is normally required to be issued within 45 days of a complaint having been filed with the USITC and USITA, which is June 12, 2017 in the case of Boeing’s complaint. Investigation will continue if the USITC issues an affirmative preliminary determination that a U.S industry is being injured by the imports under investigation, and will terminate if it issues a negative preliminary determination. The USITC does not and cannot rule on whether disallowed dumping or subsidies are occurring. If the USITC issues an affirmative preliminary finding of injury to a US industry, the USITA of the Commerce department will then proceed with a preliminary investigation of whether disallowed dumping or subsidies are taking place. This phase of the investigation is normally allotted a maximum of 165 days. If USITA reaches an affirmative preliminary determination, the investigation then proceeds to final phases, first with the USITA and then with the USITC. The normal statutory timeline in which the entire investigation must be completed is 280 to 420 days depending on the circumstances of the case. US law requires a prompt response to and adjudication of these complaints (before companies go out of business and people lose their houses? ), unlike for instance the WTO process, in which after 13 years there has been no final action on Boeing’s complaint, in which the WTO bodies which originally heard the case ruled in favor of portions of Boeing’s complaint. Does the WTO ever run out of higher bodies to appeal to? A chart summarizing the USITC and UITA investigation process for dumping and or subsidy investigations may be found at the following link. If you are interested in gory details of the “preliminary phase” in print format, read the excerpt below from the USITC website which may be found at the following link. “Antidumping and countervailing duty investigations are conducted under title VII of the law. The USITC conducts the injury investigations in preliminary and final phases. When: After the simultaneous filing of a petition with the USITC and the U.S. Department of Commerce, the USITC conducts a preliminary phase injury investigation. Duration: The preliminary phase of the investigation usually must be completed within 45 days of the receipt of the petition. If Commerce has extended its deadline for initiating the investigation, the USITC must make its preliminary injury determination within 25 days after Commerce informs the USITC of the initiation of the investigation. Finding: The USITC determines, on the basis of the best information available to it at the time of the determination, (1) whether there is a “reasonable indication” that an industry is materially injured or is threatened with material injury, or (2) whether the establishment of an industry is materially retarded, by reason of imports under investigation by the Department of Commerce that are allegedly sold at less than fair value in the United States or subsidized. If the USITC determination is affirmative, Commerce continues its investigation. If the USITC determination is negative, the investigation is terminated. However, if the USITC, in making a preliminary or final determination, finds that imports from a country are negligible, then the investigation regarding those imports must be terminated. Imports from a country under investigation are deemed negligible if they amount to less than 3 percent of the volume of all such merchandise imported into the United States in the most recent 12-month period preceding the filing of the petition for which data are available. Question: If dumping is mainly defined as selling in an export market at a price lower than the sales price in the home market, then why does the last quote in my post above, in the phrase “Preliminary Phase Anti-dumping Investigations (Imports Sold at Less Than Fair Value)…..”, seem to define dumping as selling at less than “fair value”. Answer: See the excerpt below from the glossary of the USITC Antidumping and Countervailing Duty Handbook which may be found at the link immediately following the excerpt. In Boeing’s complaint they say that since Bombardier’s sales prices were below their cost of production, dumping margin can be calculated from cost of production. Although that isn’t what the above glossary definition says, I suspect that it could well be true if Boeing’s very experienced trade lawyers elected to put it the complaint; however, in my 60 minutes of legal education, up from 10 minutes a few weeks ago, I have yet to run across the regulation that allows for this. I believe that I found the section of the US Tariff Act of 1930 that allows for basing dumping margins on production costs if home market prices are below cost of production. See below. appropriate, pursuant to this subsection. of normal value. Whenever such sales are disregarded, normal value shall be based on the remaining sales of the foreign like product in the ordinary course of trade. If no sales made in the ordinary course of trade remain, the normal value shall be based on the constructed value of the merchandise. Is it legal for a US company to sell below cost their cost of production in the US? According to the US Federal Trade Commission, in most cases it is legal. The following quote is from the US FTC website at the link immediately after the quote. Can prices ever be “too low?” The short answer is yes, but not very often. Generally, low prices benefit consumers. Consumers are harmed only if below-cost pricing allows a dominant competitor to knock its rivals out of the market and then raise prices to above-market levels for a substantial time. A firm’s independent decision to reduce prices to a level below its own costs does not necessarily injure competition, and, in fact, may simply reflect particularly vigorous competition. Instances of a large firm using low prices to drive smaller competitors out of the market in hopes of raising prices after they leave are rare. This strategy can only be successful if the short-run losses from pricing below cost will be made up for by much higher prices over a longer period of time after competitors leave the market. Although the FTC examines claims of predatory pricing carefully, courts, including the Supreme Court, have been skeptical of such claims. Q: The gas station down the street offers a discount program that gives members cents off every gallon purchased. I can’t match those prices because they are below my costs. If I try to compete at those prices, I will go out of business. Isn’t this illegal? A: Pricing below a competitor’s costs occurs in many competitive markets and generally does not violate the antitrust laws. Sometimes the low-pricing firm is simply more efficient. Pricing below your own costs is also not a violation of the law unless it is part of a strategy to eliminate competitors, and when that strategy has a dangerous probability of creating a monopoly for the discounting firm so that it can raise prices far into the future and recoup its losses. In markets with a large number of sellers, such as gasoline retailing, it is unlikely that one company could price below cost long enough to drive out a significant number of rivals and attain a dominant position. The range provisions on the Cseries order are pretty innovative. BBD is pretty damn confident that Delta will use the C for many long range hauls so they sold the plane cheap for 1000NM segments with payments due for over 1000 NM flights. They are betting that even with the payments the Cseries economics will win out over other options in Deltas fleet. Very interesting deal indeed!!! Actually no. Manufacturers hv been offering significantly reduced capability option(vs max design/cert limit for a type) in exchange for lower initial contract price all the time….actually for nearly half a century @ least. Those domestic jumbos(i.e. 747SR, 744D) without any long range capabilities(e.g. MTOW limited to as low as 240t vs the max certified 333t) delivered to JL and NH since the 1970s were good early examples. In recent decades and thx to advanced digital cockpit softwares, manufacturers offer the option to ‘retro-fit'(‘restore’ is possibly a more precise term) additional capabilities such as MTOW or max thrust settings into an airframe long after delivery. This usually involve little more than revised paperwork+software(sometimes just a push of a few buttons). In the late 1990s, the entire SQ 772 fleet were built to the 772ER std but most were sold & delivered to SQ regional fleet @ the de-rated 772 std with far less payload/range capabilities than certified for 772ER. SQ had the option(but never actually taken by SQ) to restore all to 772ER capabilities by paying more to Boeing+RR later. A more recent example is the drastically de-rated 333 which Airbus has sold a bunch to Saudia and later to China(And went a long way in filling the 330Ceo->330Neo production gap). Marketed as the 333Regional, they’re built to the 333’s 242t MTOW std but sold @ the de-rated 199t std. All hv options to restore upto the 242t MTOW std after delivery if pay Airbus+RR more later. Even Bombardier did that trick decades ago for a 44 seat CRJ200. It sold at a lower price to counter the ERJ140. They called it a CRJ440. I think BBD lawyers should argue that Boeings incompetent handling of the 787 program and the tanker program and massive associated losses are the motivator behind the complaint. After all they are about 35B in a hole on those to messes. You forgot the 747-8i. Several billion in reach forward loss in that case. Pretty sure that Boeing will declare forward loss on the 787 sooner or later. In 2005, Boeing had stalled in product development. The 777-300 standard had entered service the year before. The 757-300 and 767-400 were sales duds. Bombardier announced plans to develop the CSeries. As it turned out, the first iteration went nowhere, but this was yet to come. With Boeing doing nothing, I wrote this OpEd for the Seattle Times: http://tinyurl.com/kwjz4q8. Today, Boeing has the MAX 7, 8, 9, 10, the 787-10, the 777-8 and 9–and it claims Bombardier is poised to run it out of business. Boeing is nearly 6 times as big as Bombardier in revenues. Actually Boeing did not qualify for Chapter 11 and went directly into Chapter 7 and will soon be liquidated. Scott: Well that’s one way to put it. You are truly a kind soul. Sadly the other way is not allowed. Pure unadulterated BS is as close as I dare come. This remindsme of the Hyundai commercials. I can just hear Boeing executives saying, it’s un American to be this competitive! How does bombardier do it? Boeing’s message to the flying American public is that they will protect them from lower airfares and more economical aircraft. How big is the market for a 150 seat aircraft in the next 20 years? Boeing has to build a new wing, but what is the highest priority, a new optimal 150 seater wing, a new 200 seater wing, or the 7M7? I think they should hold ground with the 737 for the 150 seater, the new wings for larger aircraft are a higher priority. Sounds like Delta is headed for the CSeries. United could take the MAX 7, but maybe they need to optimize the length for mixed class with another stretch model 737 between the 7 and 8 at 122′ length or so. American could switch MAX 8 orders to a smaller optimized 150 seat 737 as well. If the 737 is lighter than the A320neo, it is a more optimized 150 seat aircraft. The CS500 is still years to a decade out of meaningful production, so Boeing can deliver to the market first, if they offer an optimal product. A320neo is LIGHTER than 737 max. Yes but the 737 is longer and has 12 more seats. But that doesn’t change the fact that the 737 would be heavier than it is right now if it had to conform itself with the new regulations to which both Airbus and Bombardier are subjected to. These new regulations are meant to make the aircraft more impact resistant in case of a crash in order to increase survivability. And to be more structurally resistant the A320 and the C Series had to be designed with a heavier structure than they would have had to if not for the new regulations. That being said, my understanding is that the MAX is heavier than its predecessor because its engines are heavier, and because of that the structure also had to be reinforced. Of course the same applies to the A320, but perhaps to a lesser extent because the required NEO modifications were less extensive than those for the MAX. B. Because they are complaining about a subsidized competitor that is today still relatively small, instead of only complaining about airbus or focusing on the sino Russian projects. Good thing delta ordered 100 739 back in 2011 before it became so outdated. Boeing has a bigger 737 backlog today than they did in 2005 of course. Boeing and airbus both argue over subsidies continuously, including in the media. They both have botched forecasts for various models (748/346/380/764), and delayed committing to certain models for a silly length of time (350 mk 1, 2, 3), MoM. Bombardier complained plenty about embraer subsidies too, prior to finally doing the c series. On profitability everybody is free to select the sources / metrics they like, identify with the company and be happy. As an independent investor, looking at backlog, portfolio and required investments, I would know where to go for the next 5 years. Boeing uses program accounting, the 787 program has 33 billion in deferred production cost. Airbus uses the conventional “unit-cost” accounting. Your are doing an apple and orange comparison. To put it in plane (pun intended) terms. Boeing uses Kick The Can Down the Road accounting. That means Execs rake in huge bucks as things look good. You then come up with a new aircraft, replacing (hopefully less than the 35 billion or so that was pissed away on the 787) with another can to kick. This way they never pay taxes, execs are happy. How legal that is seems to me to require a court ruling. Sadly there is not a neutral court to do so. Your facts need a wheel alignment because they pull on one side, the Boeing side. You shouldn’t say that because they use completely different reporting systems. And it has been demonstrated here several times in the past that on an equitable basis Airbus is actually more profitable. And this will become increasingly obvious in the coming years because Boeing is entering an unfavourable cycle when Airbus will just be be taking a pause. And Airbus has an even bigger A320 backlog: 60/40 in fact. Keep your eyes on that ratio. It will be a humbling experience. No, Boeing started the argument. And they pay the price today because it brought to the attention of the world the fact that Boeing has been on corporate welfare for decades. Make it ten decades. Again, completely wrong. Like Airbus by Boeing, Bombardier was sued by Embraer over subsidies and in the process the latter exposed to the world its own multiple subsidies. They are so profitable because they don’t consider the 32B they lost on the 787 to be “lost” but ..it IS indeed LOST!!! Actually it is very good the have these 33B in deferred taxes. When Boeing’s tax credits run out, you take a chunk of this 33B and write it off in one go. Result, you end up with a huge lose and a resulting huge tax credit and pay no corporate taxes for the next 5 years after which you repeat the process. And during the 5 years of profits, you can claim large “profits” (virtual of course) which can justify large bonuses (which are real). I think they only way they can write it off in one go is if they closed the 787 production line completely. Thats very unlikely, the opposite is true Boeing goes out of its way the keep old lines running. Back in 2004 it wrote off $340 mill when the 717 line closed, the 757 line was closed in 2003 with a charge of $184 mill. It seems like Boeing is doing a good job of putting itself out of business without any help from Bombadier! Lets see, shareholder buy backs that do not generate any new aircraft . Failure to replace the 737 two generations back. I really won’t engage further here though as I’m sure we’re going to go down the program accounting wormhole again; I just don’t care quite enough…. Well that’s a shame. Dip your toe or go all in. Its fun to vent, its all we have left. If I was not laughing so hard at this I would be crying. I prefer to laugh. I have had events in my life I have indeed been struck to and shook to my very strong core (good upbringing, no credit to me) and I am not the least bit ashamed to say tears fell like heavy rain. The 10,000 lb guerilla being afraid of a shrew , that is just too funny. Scott, do you know if BBD C series can be loaded with containerized cargo as Airbuses 320’s ?? This could be a strength for fast turnaround compared with bulk !!! No, the C Series has a bulk cargo like the 737. Its fuselage is actually about four inches smaller than the 737’s. But of course it’s a five-abreast, while the 737 is a six-abreast. The C Series is proportionally bigger than the A320, whose fuselage is about eight inches larger than the 737’s. Again, the A320 is a six-abreast and its fuselage is large enough to accept containers. This was a wise move on the part of Airbus. But in 1988 Airbus was still only a contender, like Bombardier is today. So it took a while to recognize the virtues of the A320. And even more so because the A320 was such a revolutionary aircraft at the time. FBW, what is that? Is it dangerous? Anyway, it’s not a Boeing, so it can’t be good. The 737 is the airplane to beat. And beat on it I will do until Boeing retires it! Well that’s kind of harsh. Just because its 50 years old, still has buttons and switches all over the place, gear hanging in the breeze, does not mean its dated. Old well proven tech I say. Solid as the year is long. Well that assumes our roof does not blow out or leaks other places where thing panels are but anyway…….. The 737 has always been, and still is, a very good aircraft. Proof of that is the fact that the 737-8 is still capable of holding its own against the A320 despite the fact that the latter is a more advanced aircraft. Of course the 737 still benefits from the grandfather clause, but Boeing was smart enough to capitalize on this and improved the 737 substantially over the years. But there is a limit to what the Boeing engineers can do with a 50 year old design. The A320 is slightly better on a number of key points and has a much greater potential as a platform. And there is the C Series and the upcoming CS500, which will make the 737 look like a Ford Model T.
Do you think Delta ordered the same version than one offered to UAL (the CS100 Lite)? I wonder if Boeing is going to offer the 737 to airlines looking to purchase Bombardier turboprops because it certainly looks like Boeing is heading in that direction! This case is so baffling that its making my brain hurt. Simple and obvious logic suggests that the floor was set by Boeing, because they won the contract. Likewise logic suggests that Boeing and Airbus would have built a C series of their own if they thought they could make money out of it.Airbus has gone as far as to to suggest that the more aircraft Bombardier sells, the quicker they will go bust. A very entertaining subject with lots of good contributions. My 2 cents worth is that it looks as though Boeing can save a lot of overhead by not bothering to prepare any 737 bid for the upcoming RFP from Delta. The damning comment on the 737 almost makes it impossible for Delta to buy any more of them and maintain credibility. Its not really damning the entire 737 line, just the smallest one. You have to see it in the light of Delta running a large fleet of 717s, which no other major US carrier does . Southwest flies 493 737-700- single class though. United has 40 737-700’s , Alaska has 12, so not a big user either. So not really news that the -700 with mixed class doesnt fit. Boeing has stretched the Max 7 , so hopefully that finds more favour. Southwest has a lot of -700 in service, but orders for new aircraft are 225 -800/max8 compared to 30 max7. Not exactly a ringing endorsement from the largest operator of -700s. I don’t think the -700/max7 is a bad plane; I think it is a bad size. The floor of the market moved up to 175 (one class) seats, which is why even the technically great C Series is having such a hard time. Two statements in one sentence and both are wrong. First statement: I don’t think the -700/max7 is a bad plane. It may not be a bad plane per se, but it is totally uncompetitive compared to the C Series. Second statement: I think it is a bad size. This is a non sequitur fallacy. There is no Worm Hole in the 100-150 seats segment and there is no Planck Wall at 150 seats. It’s all A&B propaganda to make potential customers believe they don’t need an airplane that neither Airbus nor Boeing manufacture. I think I said that the C Series is a great plane and the max7 was just not bad, so we agree on which is better. As to size, regardless of your PlankWormNonHoleWallSequitur protestations, look at industry backlog and you’ll change your mind about what is propaganda and what is truth. Low Cost Carriers order a third of new aircraft and none of them order anything smaller than a 738 or 320. Airbus and Boeing have 10,000 narrow body aircraft in their backlogs that are this size or larger. Show me the backlog numbers from any manufacturer for the size you champion, and then we’ll see. Even the hundred or so 319 and -700s in the Airbus and Boeing backlogs are often changed to larger aircraft when production time rolls around, as Delta did in this article. The deposit is smaller on the cheaper model, so the buyer gets the slot reserved and no penalty for the later upgrade, or they just improve their decision making. That one is very easy to answer; the costs of operating 737-800s / Max8 is just marginaly more than the 737-700s / Max7, so wonder what airlines are buying instead (unless you need the ‘700 performance at high altitude airports etc). The same logic applies for the A319 versus the A320. (CEOs or NEOs). Boeing has to sell 737-700 at $20M now, and pretends this affects Max pricings also. How about offering a modern / efficient narrow body instead? So it seems you are in the ‘-700 is a bad airplane’ camp, and believe that size (150 seats and below) is not the problem. Well, the C Series is a modern, efficient narrow body, offered for sale since 2008 through the biggest order bonanza in commercial aviation history, and its order backlog is 350 aircraft. The two models seat 120 and 145, depending on density. This is a poor showing, and the reason BBD has had to scrounge money anywhere it can. Well, tell that to Boeing. Not exactly. DL only blasted 73G(but admitted it’s already performing a niche role @ DL) and Max7. They did not say anything bad about 738/9ER nor Max8/9/10x and in fact still taking delivery of 739ER with over 50 frames still in the firm backlog. Of course, a 737-100 fm 1967 and a Max10 in 2020 are the same 737 for the general/non-aviation public. So if PR /Corp image is the over-riding concern for DL in fleet CapEx assessment+decision, DL can’t consider any Max to preserve credibility. BA and DAL fell out when DAL postponed 787 order. On an RFP since Anderson time he said he will not buy BA if the competitor is within a few percentage of BA. The last 10 737-9 was contractually binding on Delta. It will take a new management team to reset the relationship. One thing is clear, Bombardier is going to need China/COMAC to weather the U.S. storm. The Chinese can buy the plane, that would be a big help. They already caused enough grief with the certification issues for the center fuselage barrel they build now. Sorry, they have their own lame duck ARJ-21 to sell, BBD not allowed. Well and the lame duck 919 to. Let’s make some VERY hypothetical projections here. If China acquires BBD Aerospace division, they would have the financial incentives to market the CSeries in China, ARJ-21 or not. CS100/300 assembly would remain in Mirabel – Montreal area. (Is/will be highly automated – so no big savings if moved to China. Anyways, it would be a condition of the sale due to the Quebec gvt ownership agreement). Hypothetical CS500/700s might end up in China thought. Anyways, in lights of the current Boeing protectionist pressure, the COMAC alternative is becoming more attractive (for BBD shareholders, the Quebec gouvernment, and Canadian workers). Bombardier’s pricing on its sale of 75 firm CSeries aircraft to Delta Air Lines was “normal course” business and not improper, Bombardier Commercial Aircraft president Fred Cromer said. During a conversation with ATW and Aviation Week editors, Cromer defended the CSeries program’s most significant order, which has come under attack by both Boeing and Embraer. Boeing has formally asked the US government to protest Canadian government assistance to the CSeries program, and in particular alleges that Bombardier offered the CSeries to Atlanta-based Delta at an “absurdly low” $19.6 million per aircraft, well below what Boeing described as the aircraft’s production cost of $33.2 million. Delta placed a firm order for 75 CS100 aircraft, plus 50 options, in April 2016. “The Boeing numbers are not accurate, whether we’re talking about the sales price or the production cost,” Cromer said. He did note that “early airplanes are expensive [to produce] and every manufacturer looks at the entire program” when pricing aircraft. While Bombardier started marketing the CSeries as early as 2005, and originally intended for the aircraft to enter service in 2013, the program had endured a raft of delays and missteps when Cromer came on board in 2015 as part of a new Bombardier management team led by president and CEO Alain Bellemare. Cromer said the CSeries program was effectively “reintroduced and relaunched” at the 2015 Paris Air Show and pricing on 2016 orders, including to Air Canada and Delta, should be viewed in that context. “We were absolutely reintroducing this aircraft,” Cromer said. “We even used the words, ‘We’re relaunching the program’ … The pricing of any aircraft at any given time in a program can be volatile.” He said Bombardier had to account for the “perceived risk” Air Canada and Delta were taking by ordering a new aircraft. Boeing and Embraer, which pushed the Brazilian government to go to the World Trade Organization over the CSeries, allege Bombardier is improperly able to sell the aircraft at market distorting prices because of the Quebec provincial government’s $1 billion investment in the CSeries program and $372.5 million ($276 million) in repayable support from the Canadian federal government over four years for the CSeries and Global 7000 aircraft programs. That assistance violates trade rules, Boeing and Embraer claim. Air Canada is proudly boasting about the profit they made selling and leasing back their 787s. So, not only have Boeing lost money on every single 787 but also they sold quite a lot of them at below market value. Boeing are the ones muking it up for everyone with subsidies. Yep, they sold them cheap to start with. Same with the now cancelled and upgraded United -700 order. It just that BBD is not allowed to do that. Sale-lease back is standard in the airline industry. For Air Canada is just moving the same money around the books, as the difference between what they paid Boeing and what the leasing company paid is reflected in higher lease costs. Obviously I agree, although if you read the press releases, you wouldn’t think so. The fact remains that they sold them at a substantial profit. That first paragraph gave me the biggest laugh I’ve ever had reading anything aviation/aerospace. I didn’t believe whoever at Boeing comes up with these things could outdo their sanctimonious utterings but then I never imagined they’d been to comedy writers school. Maybe their future is with SNL? Yes it was, but there is a difference between investing into a programme, investing into a division, and investing directly into a company. 1- The Beaudier Group (Beaudoin-Bombardier) owns a majority stake in the company. 2- Caisse de dépôt owns one third of the Transportation division. 3- Québec owns 49% of the C Series programme. 4- Canada has nothing to do with Bombardier, nor the C Series, and only lend them a small amount of money, with royalties attached to it. Last time Bombardier had financial difficulties was in 2002 (post 9/11) and they had to sell the recreational product division to help them go through that difficult period. This time they could have sold the entire Transportation division, but instead found two willing investors. And if we put politics aside those can be viewed as strictly financial investments. And they are indeed very good investments that could turn out to be extremely profitable for all parties involved. What is important to understand is that the C Series programme was indeed offered to investors, and so was the Transportation division as a whole, but the entire company was, and still is, locked up into family ownership. If Bombardier issued new stock it would dilute the Beaudier ownership and they would lose control of the company. The implications of this would be enormous. Considering the low value of the stock, the company would be acquired immediately by investors looking for this kind of opportunities, often referred to as sharks, and the company would be dissolved over a relatively short period of time because its assets are worth a lot more separately, and therefore huge profits can be made by selling them piece by piece. This is a classic strategy for sharks. And Bombardier is an especially vulnerable company for this kind of transactions because they operate in the aerospace sector in which it is notoriously difficult to survive. Thats because the rest is (mostly) completely secret, they have moved away from royalties type aid as thats been seen now as illegal state aid. The sad part of this whole saga is that I am not sure Boeing realizes the damage inflicted upon their corporate image and to their flagship product: the 737. 1. Boeing is upsetting one of its most valuable customer. 2. Its financial maneuvers are exposed to the world. 3. Both the 737-700 and MAX 7 are bashed publicly by a high profile airline. 4. Boeing makes Bombardier look like a powerful company. 5. Delta makes the C Series look like a much better aircraft than the 737. 6. Boeing stands to lose an important military contract. And all this is happening in the context of an open trade war between Canada and the United States, which was initiated by the New Administration, and when it is becoming increasingly difficult for Canadian citizens to cross the border and are often held up for interrogation for interminable periods of time before being turned back after their cell phones have been seized and scrutinized. Make our friendship great again! Can we? Yes we can! Thanks for your last post. You know extremely well BBD financial situation, it shows. FWIW, the Quebec gvt 49.5% CSeries equity was acquired for a similar value that was negotiated a few weeks earlier with Airbus (that deal fell apart when leaked in the media). But then as we have seen, Boeing can be amazing. If Boeing were interested in such a deal, and I have no idea if they are, they could undoubtedly negotiate better terms if Bombardier was teetering on the edge of collapse or in bankruptcy, than they could negotiate at the present time. This would be taking a page out of Delta’s playbook, who got rock bottom prices on the C Series by passing up on offers to purchase until the program was in danger of collapsing and desperately needed an order from a major US customer, at any cost (or loss?). Regarding the Delta playbook, having manufacturers compete for RFP’s undoubtedly results in lower purchase prices, but could there be some point of diminishing return? Manufacturers need sufficient profits to invest in developing new aircraft. If a manufacturer is developing a new model and there is a conflict between the specifications that a low ball RFP buyer with a history of not buying new models wants (Delta? ), and a customer with a history of making large launch orders at going rate prices wants (Emirates? ), which customer gets their specifications incorporated in the new model? I think I remember that ex Delta ceo Richard Anderson once complained that he thought that Boeing made a big mistake not developing a 757/767 replacement. Could it be the case that Boeing chose to develop the 777X first because they knew they could count a big launch order from “First Class” Customer Emirates if they designed the plane Emirates wanted, while the only customers on the horizon at the time for a 757/767 replacement were “Basic Economy” customers who were too cheap or financially strained to open their checkbooks for a generous launch order? When I wrote :”If Boeing were interested in such a deal, and I have no idea if they are,” in my reply above to TransWorld’s post, I was thinking that TransWorld was suggesting something like Douglas’s short lived attempt at selling French made short haul Caravelle twin-jets in the United States before they decided to instead develop the DC-9, Beechcraft’s marketing of British made HS125 business jets in the US in the 1970’s (later they purchased the design and moved final assembly to the US), or Boeing’s attempt to tack the 717 onto the bottom of their product line, below the 737, after their merger with McDonnell Douglas. The arrangement that I was imagining that TransWorld was imagining, was that Boeing would get marketing rights for the C-Series in some part of the world, and Bombardier would agree not to develop anything larger than the CS300 for the duration of the agreement. Re-reading TransWorld’s post, I see that he was actually suggesting that Boeing might replace their 737 line-up with the C-Series. I consult with exactly zero airline fleet executives regarding their purchasing plans and preferences, and have exactly zero years of experience designing and assessing the design of commercial aircraft at a professional level; however, from my airline management armchair, I think it is pretty unlikely that Boeing would do any such thing. There are many thousands of 737’s in service, I believe something like 800 NG’s and 3,600 MAX’s on order, which is about a seven year backlog at a production rate of 50 a month. In the reality that I live in , most customers with 737NG fleets or sub-fleets will eventually largely replace their 737NG’s with MAX’s, which if true, would mean that Boeing will still sell many more MAX’s. Southwest with about 720 B-737’s in their fleet has about 270 MAX’s on order, so about 450 MAX orders to come? Ryanair with about 390 B-737’s in their fleet has about 170 MAX’s on order, so about 220 MAX orders to come? United Airlines with about 325 B-737’s in their fleet has about 100 MAX’s on order, so about 225 MAX orders to come? American Airlines with about 290 B-737’s in their fleet has about 100 MAX’s on order, so about 190 MAX orders to come? In the reality that my armchair occupies, 737-800 operators that are finding their 737-800 or 900’s starting to be too small for their routes might consider switching to or adding a sub-fleet of A321’s, but operators with 737-800 or 900 fleets or sub-fleets that find them to be a good size fit to their routes, won’t see any benefits in switching to A320’s or A321’s that justify the switchover cost’s (take pilots off the line for re-training, tear out the old simulators and install new ones, etc.). A bigger plane with lower CASM will only be more profitable if you can come close to selling enough tickets to nearly fill all of the bigger planes greater number of seats. In the reality that I live in, the vast majority of passengers see no difference between 737’s and A32X’s. Southwest and Alaska airlines, with all 737 fleets, have both been very successful and have pretty good customer satisfaction ratings. I know from attempting to ask my wife about what type of plane she flew on a trip, that as far she is concerned, there are two types of planes, namely 1) big and 2) small. Each is manufactured in two versions, A) engines under the wings and 2) engines in back. She has no problem with flying on either of the two types of planes, in either the front or back engines versions, as long as there is Wi-Fi and a power socket for her electronic gadgets. First Class is greatly preferred, but if her sometimes too cheap husband is having one of his recurring frugality crises, an aisle exit row seat in economy might be OK. If I give her a choice between an aisle seat on a Boeing something and a center seat on an AirBus something, I know that her response will be to get the aisle seat on the whatever type of plane, accompanied by a stare that says – are you stupid? From my armchair there just isn’t aren’t any problems so severe with the 737, at his time, that would justify such a drastic step as buying the C-Series line a replacement for the entire 737 line. If you are a US pop-singer, having the number one record on the charts is better than having the number two record, but if you go easy on the mansions, private jets, yachts, and sport cars, you should still be able to make a pretty good living if you have had number one records in the past, but your most recent one only went to number two, unless perhaps, some foreign singer starts dumping cheap foreign government subsidized records into the US. I think it is interesting to note that Boeing didn’t have much luck selling new 717’s to airlines like Delta, who were instead powering a boom in 50 seat regional jet production at the time by switching routes from mainline aircraft to regional airlines flying 50 seat jets. Meanwhile, about 15 years later, Delta has acquired just about every used 717 available to replace – guess what? – 50 seat regional jets, with accompanying press releases about what a brilliant money saving move it was to do so. Fleet management fads come and go? I usually try to stay out of the Boeing or Airbus should do this or that or is or is not doomed debate, and limit my posts to pointing out assumptions in the discussion don’t match what I observe when I am out flying for a few days about once a month, i.e. if someone is talking a lot about the potential for airline X to use type Y on trans-Atlantic routes, and I am seeing that airline X is using type Y mostly on short haul regional routes, I will toss my observations into the conversation. This one time, I let my guard down and got sucked into the A vs B vs the other B vs E thing. A proxy war on behalf of Embraer? Boeing has some business relationships with them. Doesn’t make any sense, but nor does anything else. Similarly, a Boeing NSA launched “too soon” would not have delivered more profits over the 2015-2025 period than the MAX. Just as the 787 failed to “kill” the A330, the A320 certainly has failed to decimate the 737. Embraer E-series basically put the CRJ out of business commercially (other factors of course too, but it was the dominant one.) BBD certainly complained bitterly, as their sales dried to about 10-40 per year once the E170/190 got into service. The BA BBD complaint is simply a point of principle. I doubt they win but surely an expanded front against massive direct state subsidies for a new manufacturer makes sense for Boeing, to hopefully dissuade dumping moving forward to future campaigns. The hystrionics here are certainly amusing though. FYI, 55% of Boeing Commercial profit comes from the 737. Only 25% comes from the 777 and that slowing in anticipation of the X. The rest is service. The 787 does not generate profit yet, and the 747 is a blip due to a few freighter orders. Boeing Defense, Space and Security is half again as big. The 787 is now now generating profit. Bombardier has outsold the E jet versions it competes with , 858 to 718. I am a bit surprised to see those numbers, for I thought the 737 and 777 profits were about the same, with the 737 selling in much greater numbers but with much smaller margins. Some people say the margins on the 737 are 10M on average. I don’t know what they are on the 777 but if I make a quick calculation using your numbers it means the margins on the 777 would be on average about 25M, which is much lower than I thought. My reasoning is as follow. For the 737 it would be 500 X 10M = 5G. And for the 777 it would be 100 X 25M = 2.5G. This makes Boeing’s situation even more serious than I thought. Let’s review each programme one by one. 737: Selling in record numbers until recently. It’s market share though is about 40% and likely to diminish further. The 737-8 can still hold its own against the A320 but the other variants are hopeless. No matter what Boeing says the C Series does not represent a big threat for the moment. The best scenario is 120 C Series a year after 2020. The situation could change rapidly though if oil prices were to go above 100$ a barrel. 747: Will not make a big impact on the balance sheet at this stage, one way or another. I actually threat it like if it was no longer in production. 777: The situation is still very good, but not for long. Lots of money is being spent on R&D at a time when revenues are diminishing. The 777 Classic will soon stop being a cash cow for Boeing and the early batch of 777X has likely been sold at a loss and there are no new orders on the horizon. That is the pessimistic view. Of course things could change for the better. But also for the worse I am afraid. 787: This one sticks out like a 30B sore thumb. At least it is now in neutral territory. What I mean by that is that it is no longer costing more to produce than the prices obtained on average for each aircraft sold. But it is not exactly a cash cow either. And unless new orders come in soon production rates may have to be lowered further in the future. It may actually get to a point where Boeing will no longer be in a position to extend the block of aircraft that is supposed to absorb the forward loss. If this were to happen Boeing would have to make a big write-off, or several write-offs in quick succession. And the stock would likely take a plunge, especially if the company’s entire financial situation starts to deteriorate. Which is possible, if not likely. If there is any value in what I say above this trend may actually reverse over the long term and Boeing Commercial Airplane may be the one that will become “half again as big” as Boeing Defense, Space and Security. Were the reworked 787s dumped on the market, if the sales price must reflect the true production cost? Seems like all new models are suspect. What is production cost of the first ten or twenty 777-9s? Are they being dumped? Slippery slope.